Affiliate Pay Per Click Per Visitor Program: Answers to common and frequently asked questions about Affiliate Pay Per Click Per Visitor Program. Our pay-per-click-per-visitor program is one part of our affiliate program. It is not a standalone program, but the first of 4 ways in which we pay our sales partners. Pease review our affiliate program FAQs. We currently pay 10 cents per click per visitor. So for example, if 1000 visitors click from your website or blogs to our website, we will pay you $ 100.00. You can link to any page on our website. Please carefully review the affiliate manual pages on linking to see available linking options. Will I get paid for sending millions of clicks? Yes, but we only pay for high quality traffic. So, if you send us junk or fake traffic, you will earn nothing. We only pay for high quality traffic, the kind that can only be the result of good marketing practices, gaming the system. We state this very clearly so there is no surprises. For more, please review the affiliate manual documentation on traffic quality. We pay for all activity on a monthly basis, so it does not matter when the traffic comes in, partners get paid on the aggregate. We do not care for millions of clicks, we only care about sales. Learn more about the best compensation plan for sales pros. Focus on marketing and sales, and not on generating clicks and you will not waste your time. Do I need to own a website blog to be an affiliate? Having a website or blog means you have some audience to market to. However, you still need to have access to an audience you can market to. A social media following on Facebook, Twitter, LinkedIn, Google+ and such. A large email mailing list. Since you can post text and picture banners and links in social media and email messages, you can still be a very successful affiliate for us. However, if you don't have access to any audience at all, there is no way you will be successful as an affiliate with no audience to market to. but joining or using PAY TO CLICK or TRAFFIC SALE/EXCHANGE websites is not an option for anyone. How do I link to your website? We offer a number of ways to link to our website. Please review the affiliate manual pages on linking carefully to understand all these options. It does not matter what page you link to on our website, we pay the same $ 0.10 per click for every link. Where should I send traffic to earn PPC? It does not matter what you link to on our website, we pay the same for all clicks. Linking options is well fully documented in the affiliate manual. I am shown 2 links (shop and join) on my account page, which one should I use? Depends on which of our product/service/program you choose to market. If you are only interested in marketing our products and services, you can simply link to your sales portal ( www.ajiboye.com/shop/YOUR_AFFILIATE_CODE ). If you want to just market our affiliate program and recruit more folks into your salesforce, you can link to your recruiting portal ( www.ajiboye.com/join/YOUR_AFFILIATE_CODE ). If you want to market a specific product/service/program, you can find the product page on our website, and link to it directly as such ( www.ajiboye.com/ANY_WEB_PAGE_ADDRESS?aid=YOUR_AFFILIATE_CODE ). It's all very flexible. Please review the affiliate manual carefully for more details, especially the FAQs. Finally, it does not matter what page you link to, we pay the same 10 cents per click for everything. To see your earnings, go to the clicks report; all clicks, earnings and detail stats are on the report. Every month, all the data in the clicks report are converted into commission records and paid out. At which point, you will see commission records on the My Commissions page, which are paid out the same month. Linking to our web pages is comprehensively documented in the affiliate manual. Please review that documentation carefully. If you are in a hurry, log into your account; your sales and recruitment portal links are printed right in your account summary. But remember, the most effective marketing is linking to specific product/service pages that you think your audience would want. Do you accept traffic from PAY TO CLICK networks? Using ANY website or network with a PAY TO CLICK model is against our PLAIN SPEAK TERMS. It does not matter to us what fancy description these networks give themselves, if their model overtly or covertly resembles a PAY TO CLICK model, we will add the website/network to our BLACKLIST, and will not pay commission for traffic coming from those networks. Some of these call themselves traffic exchanges, traffic buys, traffic marketing, pay to click, and so on. No matter what they are, we can spot and blacklist these networks easily when we complete manual audits before payout. Why don't you accept PAY TO CLICK networks? Because they violate the common sense rule of marketing. Folks that you are paying to click on your ad, are not looking to buy anything. Is traffic exchanges are accepted source for advertising? No, we do not recommend nor accept traffic from traffic exchanges. What websites can I market and promote on? You can market anywhere you want, or experienced with. The best places are the web properties you own: i.e. your own websites, social media profiles, blogs and so on. Additionally, using free to list properties like classified ads, discussion boards or forums and such are also excellent sources of high quality traffic. Using paid networks are discouraged unless you are a professional web marketer with experience in the target platform. If so, Ad Exchanges like Google Adwords, Bing Ads, and such are also excellent sources of high quality, targeted traffic. Pay-to-Click (PTC) and Traffic Exchanges (TE), are NOT recommended. Use other networks at your own discretion. Our blacklist are websites we have verified to be a complete waste of time and money. Wherever you choose to advertise / promote, remember basic marketing common sense. There is no magic or silver bullet to marketing; no-one can send you "real" people, no matter what they say about how they get their traffic. Don't be fooled, or waste your time. We can't comment on every network, so consult our blacklist as a starting point. Run your campaigns on any network if you really like it, but be quick to abandon networks that are proven unreal, that's what our clicks report is for. If your goal is to generate sales, don't expect you or anyone else can "send" people to buy things they have no plans to buy. Regular people are somewhere online, doing what they like to do, and can only be reached by showing ads ( either text or banners, no matter ). If they see the ad, and they like the product/service, they may click to find out more. That's it. That's all you can do, and that's all we expect you to do. If the network you use do not provide this sort of common sense, traditional advertising / marketing service, you are looking for a silver bullet that does not exist. Worse, if you run a campaign and they send you floods of "traffic", either they are doing something wrong, unethical, or worse illegal, particularly when legitimate click-through rates on the best performing traditional advertising is just shy of 5%. No matter, these tactics do not produce sales, as most of the so called traffic are absolutely fake. Our program is about Sales not traffic; keep that in mind, and stick to the basics. Can I promote / market on SOME-RANDOM-WEBSITE.com? As we cannot investigate every website submitted to us, our standard answer to this inquiry is Yes, you can. Since we pay for only high quality traffic, it really does not matter to us one way or the other where you choose to market/promote. However, we do maintain an active blacklist of websites that we are sure only delivers junk traffic, and those are marked on your clicks report appropriately should you be using any of these. These are mostly PTC websites, which as a rule offers no value and we advise partners to avoid. What is the Clicks Report? All the traffic generated by your marketing and promotion are captured and reported in your Clicks Report. The clicks report and how we judge traffic quality, and hence payout is straightforward. We measure standard web marketing KEI ( key performance indices ) such as bounce rate, click fraud rate, and son on. We track about 12 of these indices, with the major ones displayed on your report. Finally, we have quality benchmarks ( or minimums / maximums ) that we accept. The report shows your numbers on a network by network basis, and is color coded to allow you to quickly see which metric is causing you problems, and costing you payouts. Red means bad, green means good. If all your numbers are green across the board, then you are generating good quality traffic and payout is earned. If you have any red items for the network, then you are generating bad traffic and you can modify your marketing campaigns to address the issue. More details here. Clicks report's clicks, unique clicks, views per click, etc...What does it mean? Here are the important marketing terms used in the Clicks report that you need to know. Clicks - the total number of clicks originating from your text or banner links. For example, if 100 people each click ONCE on your links, your report will show Clicks to be 100. However, if 100 people each click TWICE on your links, then your clicks report will show Clicks to be 200. Unique Clicks - the number of actual people that are clicking on your links. For example, if 100 people each click twice on your links, your Clicks will be 200, however your Unique Clicks would be 100. Click Fraud - There is little reason for people to click more than once on your links. Excessive clicking is a good sign of pay-per-click fraud. Click Fraud is the difference between your Clicks and Unique Clicks. Click Fraud Rate is Click Fraud divided by Clicks multiplied by 100%. For example if your Clicks is 200, and your Unique Clicks is 100, then your Click Fraud is 100 (i.e. 200 - 100), and your Click Fraud Rate is 50% (i.e. 100 / 200 * 100%). Views - This is the total number of pages that is viewed on the website. For example, if 100 visitors (i.e. Unique Clicks ) each looks at 5 pages before leaving, then your Views is 500, and your Views per Unique Click is 5. Bounce - a bounce is when a visitor only looks at 1 single page (i.e Views per Unique Click is 1). Bounces usually mean the information that the visitor found on the page after clicking is not what they expected relative to the information in your links that prompted them to click in the first place. Bounce Rate is the ratio of your visitors that Bounce . Spoofs - are visitors that come from different places at the very same time. Spoofs are proof of automated bots, spiders and systems designed to simulate visits and user browsing patterns. We have zero tolerance for Spoofs . New Visitors - The number of visitors that this is the very first visit ever. For example, if you have 100 visitors (i.e. Unique Clicks ), but 10 of them had previously visited us in the past, then your New Visitors will be 90 (i.e. 100 - 10). What is POOR QUALITY TRAFFIC? On your clicks report, traffic you are sending us can either be marked as GOOD or POOR. GOOD traffic is high quality traffic that meets or exceed our minimum quality standards. POOR traffic is poor quality traffic that do not meet our minimum quality standards. We pay for GOOD traffic, and DO NOT pay for POOR traffic. Please carefully review the affiliate manual page on clicks report for information on how to read and understand your clicks report and payout calculation. What is GOOD / HIGH QUALITY traffic? We pay for performance; we accept only high quality traffic. High quality means people who are actually looking for products and services we provide. They behave differently which our systems track and analyze. So keep it simple, if you are genuinely marketing with intent to sell any product/service we have, and you are promoting these to an audience that may be interested in buying these products/services, then will naturally produce high quality traffic. We pay only for high quality traffic. What is traffic quality and how does it affect my payout? All clicks are not born equal, we only pay for high quality traffic! Click fraud affects online and programs like ours are targets for fraudsters and abusers trying to game the system. It is fairly easy to simulate clicks online, what is not easy to do is simulate high quality traffic. So we only pay for high quality traffic. Visitors interested in message, explores product/service details and other information on the website. Traffic flow reflecting these steps have a high quality signature. In technical terms, we see lower click fraud rate, lower bounce rates, higher pages per view rates, no spoofs and so on. We track up to 10 key performace indicators indicating the quality level of the clicks traffic you generate for us. If your clicks traffic meet or beats our minimum requirements, we pay you for the high quality traffic you are sending us. If your clicks traffic do not meet our minimum requirements, we do not pay you for the poor quality traffic you are sending us. How can I improve the quality of my clicks traffic from networks I market on? Poor traffic quality will cost you dearly in payout income. Things like high bounce rates, low views per page and so on are clearly marked on your clicks report showing you where to improve your marketing to earn the payouts for the traffic you generate. High bounce rates, and other negative quality traffic metrics are all due to a simple fact: the intent of the visitor clicking on the link. So it goes like this: the advertisement ( banner, or link ) that the visitor is viewing on these networks must match the content on the destination page that you send them on our website. We have a lot of pages with product and services information, and we make it easy to link directly to those pages that match the copy of what you are promoting on your networks. For example, if you are promoting website solutions, it is better to link directly to our website solutions page ( http://www.ajiboye.com/website ) or even more specifically website design ( http://www.ajiboye.com/website-design ) page, rather than your standard sales portal website ( http://www.ajiboye.com/shop/YOUR-PARTNER-ID ) which basically is just a redirect to our own home page ( http://www.ajiboye.com ). The bottom line is if you are showing an ad selling website design to someone on a website and they click on that ad, they expect to see information about website design immediately on the page they end up on our website. Website users are impatient, and may not go looking around on the website for the information; they just leave which is what a bounce is. Bounces directly affect your average page views per click, driving it down well below our required threshold. And so on, it's a ripple effect affecting all the other quality metrics we measure. So all you have to do to assure good quality traffic from clicks you generate is to market carefully and properly by trying to understand the audience that you are marketing to. Do they want to actually buy a product? If so, are you taking them to the right information page on our website? For information about linking to pages on our website, please review this page of the affiliate manual again. If you need more assistance, please contact the Helpdesk. When is the clicks report updated? Your clicks / traffic are captured and store, and the clicks report shows you the quality and payout analysis for the traffic you bring us. Our reporting is real-time... which basically means the reports are prepared when you access them. However, if you are accessing the same report multiple times a day, it will be cached for performance reasons. Cached reports have a date and time stamp indicating when the report was originally prepared. Right now, click reports are cached for 3 hours, which basically means if you access your report within any 3 hour window, you will get the copy prepared in the last 3 hours. Please note, cached reports do not mean that your clicks/traffic data is not been captured properly. My clicks report says I earned $ X.00, but my commissions page shows nothing! The clicks report shows you the commissions/payout you earn during a period, default to the current month cycle. At the end of the month, what it shows is processed automatically and a commission record is created for you, which you will find on your commissions page, marked as due. Then our auditors review your due commissions for the month and review your clicks report for any sign of fraud. This happens every month between the 1st and 12th of the month. If everything checks out, the auditor approves your commission and payment is issued immediately, usually made by Paypal, unless you changed the payment method on your account. Is it the recruit website that allow me to earn $ 0.10 per click or the shop website? It does not matter, all of our pages payout the same rate. You can send people to the recruit address, or your shop address, or any other webpage ( as long as you link properly ), on our website, and it's all the same. Please be sure to review pages in the affiliate manual on how to link properly. Spoofs are cross-bleeds in traffic referrers. In the simplest form, this means more than one affiliate "claiming" to refer the same visitor at the same time ( time period ), which would be physically impossible. For example, you may claim that you are sending a visitor from one ip address to our website from your website, while at the same time, the visitor is seen coming from the same ip address to our website from yet another website, but this time by another partner. Spoofs only result from automatic traffic exchange systems, which as you know are not acceptable to us. Why no data in my clicks report? The clicks report only shows clicks that come from online sources ( i.e. websites, or blogs where you are marketing on ) as defined by the presence of an HTTP_REFERER dataset in the click data we receive. For example, if you are marketing on twitter, the HTTP_REFERER data that is passed along with the click will be set to twitter.com, so we know where the traffic is coming from. To mitigate fraud and manipulations, all clicks that do not have a valid HTTP_REFERER dataset are automatically discarded by our system. Note that this technical limitation unfortunately negatively affects clicks originating from offline email programs like Microsoft Outlook, and Mozilla Thunderbird. If you are testing your links and do not see any clicks data in your report, make sure that you are clicking on links ( text or banners ) on an online source to make sure that a valid HTTP_REFERER dataset is passed along with the click data. Click fraud and click fraud rate are standard metrics in measuring and reporting online ad performance. If you take the total number of clicks, and subtract the total number of unique clicks, what you have left is click fraud. For example, if your campaign generates 10 clicks ( i.e. total clicks ), from 3 people ( i.e. total unique clicks ), that means you have 7 clicks left ( i.e. click fraud ). Fraud is a harsh word, but that's the industry term, not our own. All it means is that some of your 3 people must have clicked more than once, to generate those additional 7 clicks. On our system, we allow a certain rate of click fraud ( i.e. 40% ) because you cannot totally eliminate click fraud from online traffic. However, industry average is 28%, so our cutoff of 40% is more than generous. Facebook will not let me post. Unfortunately, your issue can only be resolved by Facebook. 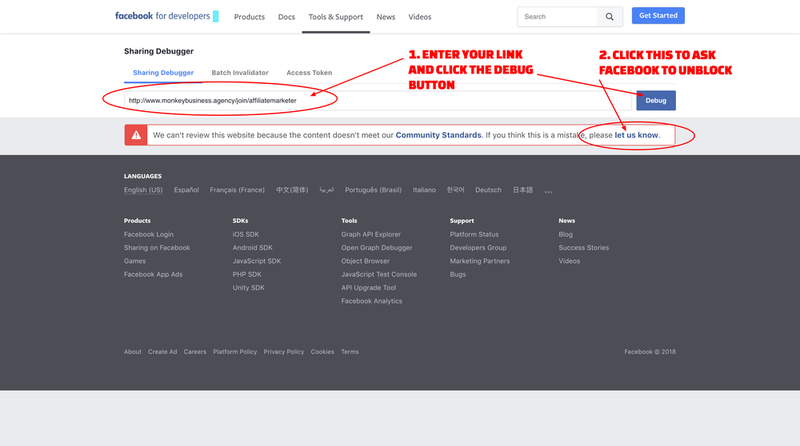 You can use the Facebook's Sharing Debugger to troubleshoot links you are having problems with, and ask Facebook to fix it. You may be looking at a cached version of the report. Click reports are not real-time, they are cached for performance for 3 hrs...which means they are updated every 3 hours. If you are testing to see if clicks are properly reported, change the report date range at the top of the report to get a version of the report that is not cached. 3) You are not using link shorteners like bit.ly, etc. 4) You are not redirecting clicks.